Seattle is deemed to be one of the most expensive places to live and it is. But unlike many of the very high price places that require you to at least earn a middle or high income amount, Seattle is an exception along with a few other cities. If you are wondering if there is a way to slash the prices of at least 50% or more, it can be done. You do not need some coupon but just do price comparison and I can tell you what places are worth buying food from which is affordable or cheap. One of the places is Grocery Outlet which charges you cheap compare to the big name brand stores such as Safeway and QFC. Almost everything is worth getting with the exception on some fruits and veggies which you need to keep an eye on if it is still fresh. QFC may be a bit pricier but they always have fresh fruits and vegetables while throwing away the ones that are going bad. You don’t see that all the time in most grocery stores. The milk and meat products charges more which you may consider buying them at Safeway or somewhere that may be much cheaper. Most stores have some organic fruits and vegetables, which is much healthier compare to the regular kind because they do not use pesticides and other chemicals. But most people can’t afford to buy them since they do charge a bit more. 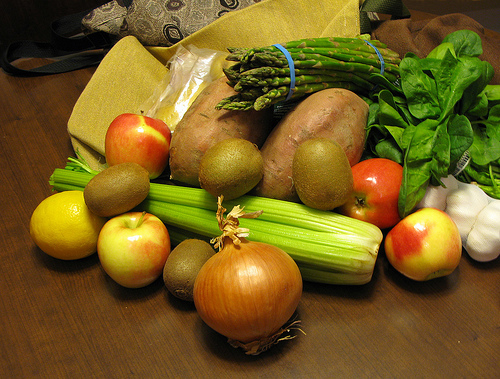 If you are willing to pay more by eating healthier fruits and veggies, you may consider getting some organic ones. Forget buying some junk food that is covered with nasty chemicals such as partially hydrogenated oils or monosodium glutamate. I consider eating healthy stuff for most of the time but once in a while, would go nuts such as on chocolates or ice cream. Personal trainers like to tell their clients to eat naughty kinds of foods once a week on one of the meals on a day that you can cheat. That way, you won’t lose track of your progress. It is sad to see that there are many people who forego buying cheap items on junk food instead of buying healthy foods which may seem somewhat expensive. But in my opinion, I prefer living healthier than to get so run down on unhealthy stuff all the time. It was that way when I was pregnant with my first kid. And she would be nine years old this month. My hon and I tend to go grocery shopping for most of the time at Safeway because it is just a couple of blocks away. I like their customer service where they have friendly people working there but sometimes, they don’t keep track on the fruit and vegetable areas all the time. But that doesn’t happen often since we still go there to shop. My two and five year olds love to ride the two-seater shopping cart where kids can go in front of it and sit down. Sometimes my shopping experiences go good while on the other hand, if they are very active, I would get mad. But I wouldn’t change it for the world since I appreciate having my kids with me when do. I hope that you decide to take my advice on where to go for grocery shopping whether you are a tourist or not. And if you combine that with the days that they have certain items on sale, you would save more money too. If you want to learn more on how to eat healthy, there are many places to learn it from online and offline sources. I may consider writing about that on the next article. This post was written by Laurie Tam. Laurie is a freelance writer that specializes in online article writing, blogging, and online marketing. She loves to write about finance, business, marketing, social media, fitness and nutrition. Hi Sun – I subscribe to your blog to read about your thoughts and experiences. These 3rd-party articles are generally useless, and “Grocery Shopping in Seattle” is completely irrelevant. I hope you’ll eliminate these sorts of articles, or at least keep them on topic. Thanks for the comment, Andy. I am trying to introduce different opinions that cover different topics. There’s definitely a balance between diversification and quality which I will pay more attention to. I agree. This article is very stream-of-consciousness. It’s really unclear what the point is. And since when is Seattle one of the most expensive places to live? I used to live there and would say that it’s very moderate in terms of cost of living. Come to Hawaii and you’ll learn very quickly what constitutes “high cost of living”.